Recently I had the opportunity to host the most interesting event, and I have been anxious to tell you all about it. 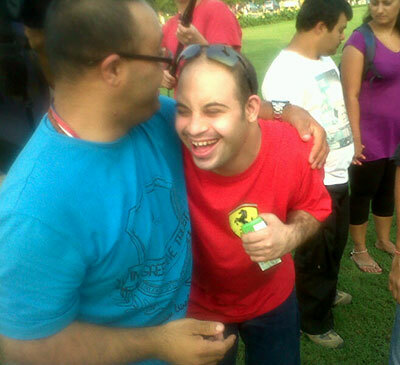 I received a request from the Israeli Embassy in India to host a group of 11 young adults with Down syndrome and 11 of their siblings/cousins. The embassy had requested for a mixer where the group would be able to interact with the young adults with Down syndrome from India. I very graciously accepted. My tiny chapter has only two young adults with Down syndrome, so I contacted a local organization called Muskaan and invited them over for the event. Even though we had a fun plan in place, I had my doubts. There was the obvious language barrier with Hindi, English, and Hebrew in the mix and several other unanswered questions. I gathered a group of 6 young adults and their family members. I also had a few volunteers join in as well to facilitate interaction. The plan was to have a picnic lunch at the India gate and then head to the Israeli embassy for a formal interaction with the ambassador. 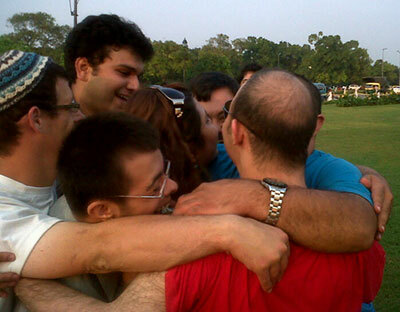 The two NACD young adults who accompanied us were Shaurya Mehrotra and Karan Bhatti. As we all were heading down to the venue, I stood in front of the mini bus and ensured that our guests from Muskaan were doing fine; and Shaurya made sure that I was too. Every ten minutes or so, he would ask me, “Are you fine, Prachi?” Within 5 minutes of being introduced to each other, we had all forgotten each other’s names, but everyone knew who Shaurya and Karan were. They continued to entertain us for the hour we were in the bus. After the merry ride, the picnic was even more fun. All my doubts evaporated. As I was busy talking to newspaper reporters, Shaurya took over the job of making everyone feel at home. Love flowed through as everybody interacted through hugs. Shaurya was most liberal with his hugs, with Karan in close second. After a quick lunch of Indian food and Israeli delicacies, it was time to play games. I will confide to you that another fear I had was my NACD troop of two being over shadowed. I never had expected a take over, and that is what it was. Next at the embassy, we gathered to hear the Ambassador extend us a welcome and thank NACD. Our friends from Israel shared their experiences and then I was called upon to say a few words. All this while Shaurya was on the stage applauding and encouraging everyone who spoke. When I finished I asked him if he wanted to add something. He asked for a group hug. Everyone obliged and quickly converged. I saw some quickly retract to different corners of the room wiping tears as the rest of the group extended the hug. Thereafter it was a somber affair as they enjoyed the snacks and then somber goodbyes. With a new experience, new realizations, and newfound love and respect, the troop of two conquered many hearts that day.